You will be dining at Bogey's Restaurant in DeFuniak Springs. Each family will be paying their own bill at the restaurant. The Panhandle Region group will be meeting in DeFuniak Springs to enjoy the Christmas Holiday Display around Historic Lake DeFuniak! Christmas Reflections in DeFuniak is an annual decoration and lighting event and is a popular tradition! We'll meet up for dinner at Bogey's Restaurant at 5:30pm. This restaurant is 4 blocks from the Supercharger, so we have the option of parking at the restuarant or supercharger. If need be, we can rotate cars so everyone can have an opportunity to charge! After dinner, we can tour the Christmas Reflections display at our leisure. This can be toured either by walking or driving. An additional bonus for this night will be the grand reopening of the Historic DeFuniak Hotel! The hotel which is also a few blocks from the Lake, will be open for a social with beverages and snacks from 5pm till 10pm. To give the restaurant a headcount, please RSVP by either registering for this event on our website or emailing Denise Grant at grantcounsels@aol.com. Denise will be out of town from Nov 3 until Nov 16, so if she doesn't respond to an email sent during that time, please be aware that she will respond beginning on the 17th when she returns. Florida Tesla Enthusiasts, Inc. is an enthusiast club and 501(c) 7 non-profit organization. It is registered with the Florida Department of State and is also registered to do business in Florida as Tesla Owners Florida. The use of the trademarked name "Tesla" in our club names is strictly for the nominative purposes of description and identification as granted by the Lanham Act for fair use of trademarks. Its use is in no way intended to imply any business affiliation with Tesla Motors, Inc. or its subsidiaries. Our club participates in the Tesla Owners Club Program. 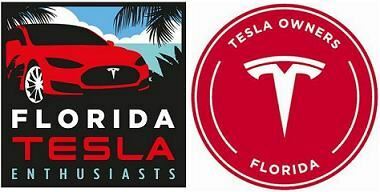 While it is recognized and sanctioned by Tesla Motors through the program, Florida Tesla Enthusiasts, a/k/a Tesla Owners Club of Florida, is an independent enthusiast organization and is not affiliated with Tesla Motors, Inc. or its subsidiaries. TESLA, MODEL S, MODEL X, MODEL 3, POWERWALL and the “TESLA,” “T” and “TESLA and T Flag” designs, and certain other marks, are trademarks or registered trademarks of Tesla Motors, Inc. in the United States and other countries.